Official Description: After hearing rumors about surviving Airbenders, the kids journey to the Northern Air Temple to see for themselves. What they find there could spell disaster for all enemies of the Fire Nation. This episode was kinda sad. Kinda sad for Aang, because everything he k new about the northern air temple had been destroyed. Aang was pissed off big time. Plus the Northern Air Temple had the history of his people, and that was gone, completley gone. I would be pretty pissed off if that happened to my culture. In all honesty I would have gone Avatar State and killed them all. But thats just me. I kinda expected Aang to be a bit madder than he was. Even after the inventors story. But I thought the way Aang reacted was just right. Going into the avatar state would have been way overkill. I think the War Balloon will be introduced later in the series. Then the Fire nation will be very powerful. They will have a navy and an air force. I find it ironic that people of the earth kingdom are obsessed with flying. Its like they were born in the earth kingdom but have but have the free spirit of an air nomad. I will be ****ed if that fire balloon isnt used in the fire nations seige of Bah Sing Seh. Well, they say that the grass is always greener on the other side. Jeong Jeong expressed that he liked waterbending better than firebending too. It looks like it is only Teo and the Mechanist's group that seem to have an interest in flight. Most people of the Earth Kingdom seem not to care at all. All your Yatta are belong to Numa!! that was it. When are they going to use them? WHEN?! Behold my amazing skills I'm trying to make you believe I have even though I don't really have any. I'm new here! Hello everybody! The balloon thing at the end I was like: OMG so ironic. I really liked that episode. Zuko: Earth kingdom it is! 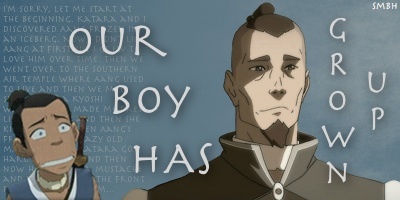 Zuko: My father says she was born lucky, he says I was lucky to be born. Aang: My friends need to suckle these frogs! No no, definitely my least favorite episode. The ending was terrible. He said the people were like a hermit crab?? NO NO NO! They DEMOLISHED his temple, KILLED the creatures, BLEW UP the sanctuary, STUFFED THE FOUNTAIN WITH SLIME, those scum bags are way worse than the fire nation. Remember, when the Fire Nation killed all the monks in the Southern Air Temple, at least they weren't heartless. They left the buildings all standing and peaceful, a tribute to the memory of the people. But no, this psycho inventor blows up all the history of the people and then laughs about it. Allthewhile giving the FN more efficient ways to destroy OTHER PARTS of the world. Worst episode EVER!!! SOME NICE AVATAR STATE WOULD BE HELPFUL!!! Aang went in the state for just one monk at Southern, and when he finds the Northern temple, not only is EVERYONE dead...They destroyed his people's home and turned it into a slime pit. AND, they stole their gliders and made crude wannabe gliders to pretend they were airbenders. those scum bags. the kids in a wheelchair. boo hoo. no one cares about HIS history. the air nomads are way more important. KILL THEM ALL I SAY! KILL THEM ALL! This episode was not very great for an Avatar episode, but it had its moments. The ending with fire insignia on the hot air balloon was mildly dramatic. It felt unnecessary to me to have the whole minor storyline of people living in the temple but the invasion part was the best it was like airbenders vs. firebenders. Well, not my favorite episode at all. Probably the only thing I liked was the war balloon reference, since it seems like it will make an appearance later. People have been mentioning about the War Balloon. I have a feeling we may never see it, firstly you need a few Firebenders to keep it airbourne, and while shooting down fire aswell? Just how effective would they be from that high, also they seem very susceptible to attack be me (easy to shoot down) and to mass produce them would take years. I admit it wasn't a good episode but I still like the big boom at the end. I don't really like this episode, even though it does have two kind fore-shadows with the war balloon and "They have the spirit of airbenders"
I liked the Sokka+inventor story, just because it shows Sokka being smart. It's about time they showed Sokka being smart. Zuko wasn't in this episode. You're thinking about "The Southern Air Temple", which is Episode 3 in Season 1. Eh. The entire episode doesn't sit right with me. I kind of agree with others that Aang should have been angrier or more hurt. The temple was after all - a temple, a sacred area and from the sound of it it was important to the Air Benders before they were wiped out. Best part of the episode for me was when Aang knocked off their wrecking ball. I just really don't like how Aang could take everything so well, what little was left of his people was desecrated and destroyed.. and he kind of just accepted the Mechanist's excuse of "My bad, have you met my crippled son? l0l!"